Usually after I tell people I attend Lesley, they immediately follow up with “oh, are you majoring in Education?” When I say no, they guess counseling, art therapy, or something in LUCAD. Nobody has ever guessed Business. While our Education and Counseling programs are incredibly well known and respected, our Business program is not as well known. On a list of the best business schools in Massachusetts, it did not even rank in the top 100. (send link). However, with the hiring of Dr. Jonathan Jefferson last year, the business program is finally getting the makeover it desperately needed. Dr. Jonathan Jefferson is immensely experienced in areas of consulting, business, and leadership. He was the managing director of Jefferson Consulting Group, LLC. He was the Director for the Institute of Leadership at the United States Coast Guard Academy, the Dean of Business Administration at Clark Atlanta University, and the Dean of the College of Business at Albany State University. He has four degrees, one of which is a Masters in Engineering from Cornell University, and he has his Doctorate from Colorado Technical University. He is now the Chair of the Business Department here, and has completely re-written the curriculum and the required classes for Business majors, as well as the MBA program. He is a professor of Business Analytics, Business Negotiations, the first year seminar for business majors, and Leadership. When I asked Dr. Jefferson about his goals for the new program he handed me a proposal for the MBA program (which also directly reflects the Bachelor’s program of study). The objectives of the program are to create critical thinkers who are discerning, pioneering, emotionally intelligent, and groundbreaking. The major themes in the new program, which are meant to set apart Lesley’s business degree from local schools, while also maintaining Lesley values, are: social justice, leader development, and social responsibility. A few of the new required classes include: two semesters of business statistics, a class that has real job training and certification attached to it. Marketing, Human resource management, and managing in the global economy have all been added to the list of degree requirements. These new classes are showing a wide range of aspects in the business world, as opposed to the old classes which were centered around economics, accounting, and management strategies. Students are also now required to have at least 15 extra credits in order to specialize in something like (entrepreneurship, non-profit, sport management, etc). This creates a much stronger foundation for students pursuing their specialization in graduate school or beyond. What could these changes and enhancements in the Business program mean for the whole school? Possibly more students: students that are held to a higher and more rigorous standard; and a degree that is much more widely accepted (and respected) by potential employers. 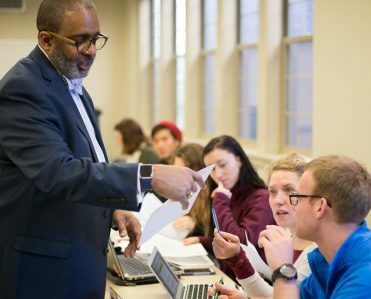 Dr. Jonathan Jefferson in the classroom.